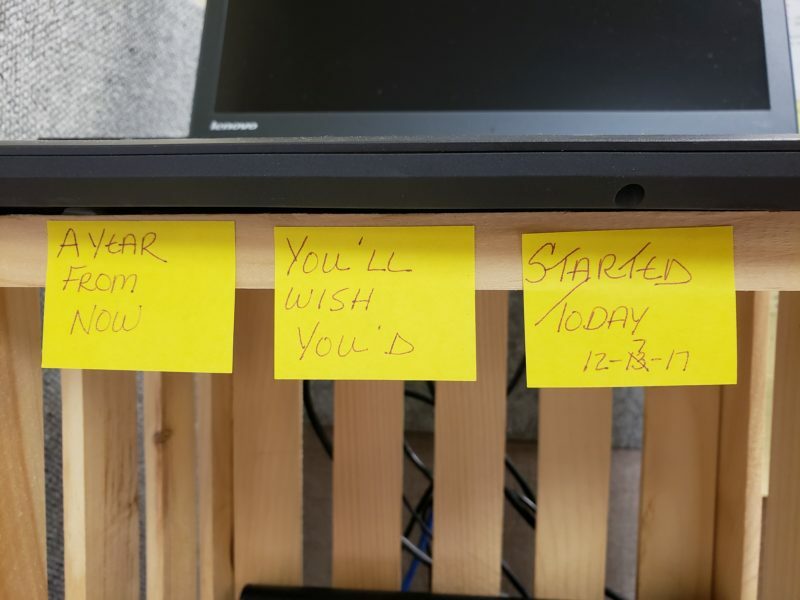 On December 6, 2017 I hung this saying at my work desk – “A YEAR FROM NOW YOU’LL WISH YOU STARTED TODAY 12-7-17”. Best. Saying. Ever. In the past, a new January would roll by and I’d wonder what I had done for my health the previous year and would have regrets for doing little or nothing. After watching some documentaries, I made the decision that I would improve my health and well-being and started eating better with little processed foods and including more plant-based foods into my diet. I thought that I would walk “when the weather got better” but didn’t really do too much exercising except for a dozen Pilates classes. While I loved Pilates, I didn’t like the cost or rushing to a class directly from work. Meanwhile, in my spare bedroom, a Total Gym and exercise bike were gathering dust. The Total Gym infomercial kept appearing on my TV and I watched it repeatedly, especially the episodes with Christie Brinkley demonstrating the Pilates exercise and saying that you could get a great workout in just minutes a day. In February 2018 I purchased the Pilates kit, dusted off the gym and bike, and had my first workout. Being the competitive person, I can be, I knew that I needed to have daily interaction, or this would, as so many other things, become something I would do hard for two weeks and then life and excuses would get in the way. I then found the Total Gym Addict Facebook group, a group filled with positive and like-minded wonderful people. The Facebook group also offers challenges and links to new videos to workout with. Rosalie Brown is in the group and she and her workouts are so inspiring! Since August 2, 2018 I have been on the Total Gym four times a week minimum (at least 15 minutes a day). There was a post in the group about a goal of #200workouts and that became something for me to strive towards. During my workouts I do what I can to my ability that day, with some days working out longer than others, and my preference is to do more reps with the gym at a lower level. The Total Gym has so many exercise options and attachments that it makes workouts fun and can be difficult to choose which exercises you want to do that day! My favorite exercises are anything to do with arms, legs, squats, the Pilates bar, and the Cyclo Trainer 2. The post Total Gym Addicts, Terri’s Story appeared first on Total Gym Pulse.